The former Daily Show correspondent, who co-starred in “Million Dollar Arm,” throws a decent strike. 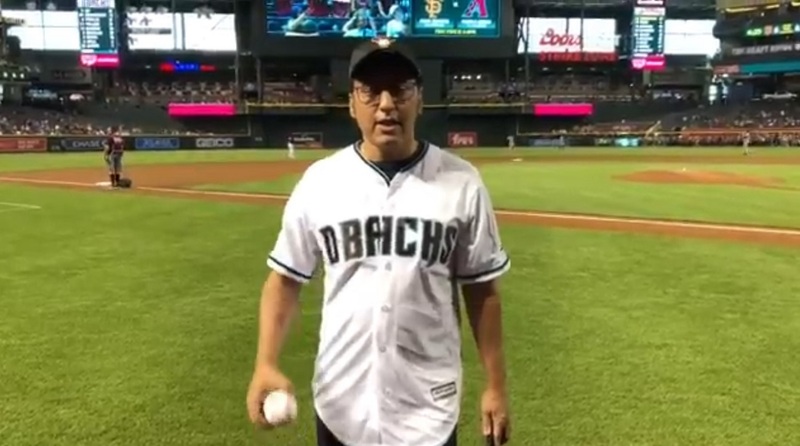 Indian American actor and comedian Aasif Mandvi threw the ceremonial first pitch at the Chase Field in Pheonix, AZ, home of the Arizona Diamondbacks, before the D-backs’ game against its NL West rival San Francisco Giants on Friday. “Play ball,” he roared after throwing a decent pitch to Diamondbacks catcher Alex Avila that seemed like a strike. “Thank you @dbacks for inviting me to come throw the first pitch in tonight’s game,” he tweeted on Friday night, thanking the team for gifting the ball and the jersey. Of course, the tweet was capped with the hash tag #milliondollararm, a movie he co-starred. Mandvi turned out to be a talisman for Diamondbacks, who pummeled the Giants starter Chris Stratton for five runs in the first inning to on the way to a 6-3 victory, which helped the team to pull into a tie in the NL West with the Los Angeles Dodgers. Well if @aasif says it, let’s make it happen: Play ball! “Million Dollar Arm,” a Mandvi co-starer, is on two Indian pitchers, Rinku Singh and Dinesh Patel, who won a reality show and came to the United States. Mandvi joins a small group of illustrious Indian Americans who have thrown ceremonial first pitches at Major League Baseball games. In 2015, former Miss America Nina Davuluri thew the first pitch at a Philadelphia Phillies game. Prior to that, ace immigration lawyer Sheela Murthy, founder of Murthy Law Firm, threw the first pitch at her hometown Baltimore Orioles game.